The Battle of Antioch (8 June 218) was fought between the Roman armies of the Emperor Macrinus and his rival Elagabalus, whose troops were commanded by General Gannys, probably a short distance from Antioch. Gannys' victory over Macrinus led to the downfall of the emperor and his replacement by Elagabalus. Macrinus' predecessor, Caracalla, was murdered by a disaffected soldier during a campaign against Parthia on 8 April 217. Macrinus himself may have had a hand in the murder of Caracalla. Within days of Caracalla's death, Macrinus was proclaimed emperor with the support of the army. At the time of his accession he inherited all of the problems that Caracalla had left for Rome—war against Parthia, threats from Armenia and Dacia, and extensive fiscal expenditures. Macrinus successfully concluded a peace with Parthia, but it came at considerable cost to Rome. Finally, his policies to reduce monetary expenditures only stoked discontent within the military. Caracalla's mother's sister, Julia Maesa, took advantage of the discontent of the soldiers and spent from her wealth to champion her grandson Elagabalus as the rightful heir to the empire. Elagabalus, chief priest of the god Elagabal, was proclaimed emperor by the soldiers of Legio III Gallica (Gallic Third Legion) at their camp in Raphanea on 16 May 218. In response, Macrinus sent one of his generals, Ulpius Julianus, with a small cavalry force to quell the rebellious soldiers. The cavalry defected and killed Ulpius Julianus, sending his head back to Macrinus in Antioch. The decisive battle took place less than a month later. While Gannys had the numerical advantage, in the opening stages of the battle Macrinus' Praetorian Guards broke through Gannys' lines, and the latter's troops began to flee. In response, Elagabalus' mother and grandmother joined the battle and rallied the troops while Gannys led his own charge. Gannys' troops turned and renewed the assault, causing Macrinus to flee the battle in fear and return to Antioch. He sent his son and co-emperor, Diadumenian, to Parthia and tried to return to Rome. Both he and his son were caught en-route and executed. Elagabalus entered Antioch as the new emperor of Rome, and with Macrinus dead, the Senate had no choice but to acknowledge the ascension of Elagabalus. By March 222 A.D., Elagabalus was himself killed by the disgruntled Praetorian Guard, declared an enemy of Rome and subjected to a damnatio memoriae. Macrinus' predecessor Caracalla was murdered on April 8, 217, during a period of war with the Parthians, near Carrhae while traveling en route to visit a temple. His murderer was Justin Martialus, a soldier who was incensed after being declined the rank of centurion. Martialus was himself cut down by Caracalla's German Guards immediately afterwards, a convenient fact for Macrinus, at the time a Praetorian prefect, who was involved in the assassination. One reason for Macrinus to have intrigued against Caracalla was out of fear for the security of his own life. A story documented by Roman writer Herodian and supported by some later historians details the events leading to Caracalla's death. The story goes that Macrinus, in the course of his employment, was often tasked with reading dispatches sent to Caracalla for him. One such dispatch detailed a prophecy, perhaps fabricated, from the oracle at Delphi suggesting that Macrinus was destined to kill Caracalla and succeed him as the next emperor. In the immediate aftermath of Caracalla's death, Adventus was selected to serve as emperor, but he declined the position due to his old age. The army then chose Macrinus; they had no feelings of 'love or esteem' towards him, but there was no one else competing for the position. The army proclaimed Macrinus as emperor three days after the death of Caracalla, and named him Augustus. The results were applauded by the Senate at first, who were glad to be rid of the former emperor. But tradition held that the emperor could only be selected from among the Senate; moreover, Macrinus was a member of the equestrian class, the lower of the two aristocratic classes. These disadvantages led the Senate to severely scrutinize his every action. Their opposition, however, was not backed by any actual power. The military at the time was concentrated against the Parthians in the area around Edessa (modern Şanlıurfa, Turkey), so there was no force anywhere in the Empire that could contest the status of Macrinus. As the new emperor, Macrinus had to deal with the major threat of the Parthians, with whom Rome were currently at war. An indecisive battle at Nisibis is cited as a reason for the opening of peace negotiations. Negotiations may have been favourable for both sides; Rome was being threatened by Armenia and Dacia, and the Parthians were far from home and low on supplies. The settlement, however, was viewed by many people as being unfavourable to Rome. The Roman historian Cassius Dio wrote that a concession of 200 million Sesterces was rendered to the Parthians in exchange for peace. Historian Andrew Scott doubts the credibility of this high figure, noting that Dio's records are frequently unreliable on finances. Regardless, the prevailing opinion accuses Macrinus of being cowardly and weak during negotiations. With the peace treaty concluded, Macrinus took measures to control the expenditures of Rome, by reversing Caracalla's changes and thus effectively reinstating the fiscal policies of Septimius Severus. This included a reduction in pay and benefits for Legionnaires, which was not popular with the Army who had placed him in command. These policies applied only to new recruits, but the enlisted soldiers saw this as setting precedent for further changes to the fiscal policies brought in by Caracalla. The sullen behaviour of new recruits, who entered service committing to greater labour for less payment, only furthered discontent among the soldiers. Gibbon suggests that from here only a small spark was required to ignite a rebellion. 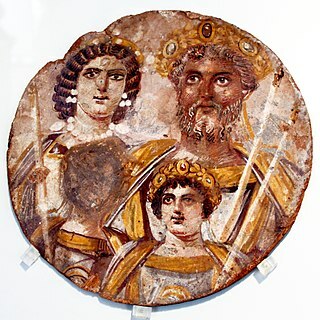 Following the death of Caracalla, Macrinus allowed Caracalla's mother, Julia Domna, and his aunt Julia Maesa, to settle in their home town of Emesa. Julia Domna, who was working in Antioch at the time of Caracalla's death, attempted suicide and eventually succeeded by starving herself. Her sister Julia Maesa, however, returned to Emesa with her family finances intact. 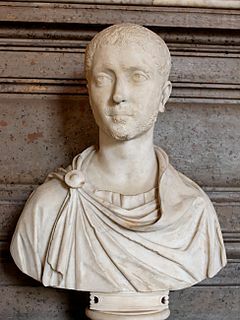 Julia's suspicions regarding Macrinus' involvement in the death of Caracalla led to her championing the case of her grandson, Elagabalus, as the rightful emperor. At the time Elagabalus was the chief priest of the Phoenician god Elagabal in Emesa. The soldiers nearby frequently visited the temple where Elagabalus was chief priest, to watch him perform his rituals and ceremonies. At one of these visits, Julia Maesa took the opportunity to inform the soldiers, it is not known whether truthfully, that Elagabalus was Caracalla's son. Simultaneously, she may have seen the opportunity to use her family's wealth and prestige to set in motion her plot. On the night of 15 May 218, Elagabalus was taken, by either Julia Maesa or Gannys, to the camp of the Legio III Gallica at Raphanea and presented to the soldiers stationed there. In one account of the events, Elegabalus was saluted as Antoninus by the soldiers, after his father Caracalla whose official name was Marcus Aurelius Antoninus. Enticed by Julia's bribes, the legion proclaimed Elagabalus the rightful Emperor of Rome on 16 May 218. In Gibbon's opinion, Macrinus might have been able to stop the rebellion in this early stage, but failed to contain it because he was unable to decide on an appropriate course of action and instead remained at Antioch. With the support of an entire legion, other legionaries, prompted by discontent over pay, deserted Macrinus and joined Elagabalus' ranks as well. In response to the growing threat, Macrinus sent out a cavalry force under the command of Ulpius Julianus to try and regain control of the rebel soldiers. Rather than capturing the rebel forces, the cavalry instead killed Ulpius and defected to Elagabalus. Following these events, Macrinus traveled to Apamea to ensure the loyalty of Legio II Parthica before setting off to march against Emesa. According to Dio, Macrinus appointed his son Diadumenian to the position of Imperator, and promised the soldiers 20,000 Sesterces each, with 4,000 of these to be paid on the spot. Dio further comments that Macrinus hosted a dinner for the residents of Apamea in honour of Diadumenian. At the dinner, Macrinus was supposedly presented with the head of Ulpius Julianus who had been killed by his soldiers. In response, Macrinus left Apamea headed south. By the early third century, the balance of power had shifted from the Senate to the army, and the position of the Senate was considerably weakened. The emperor of Rome was appointed by the support of the military, while the Senate existed solely to officiate state affairs without any real authority. Both Macrinus and later Elagabalus secured the support of the military while generally disregarding the opinion of the Senate. Macrinus was in dire circumstances after Elagabalus' rebellion and had no other choice but to turn to the Senate for assistance. While in Antioch, Macrinus made one final attempt at securing support, this time from Rome. A combination of distrust from the Senate, insufficient funds, and Elagabalus' impending approach, however, forced Macrinus to face Elagabalus' approaching legions with only his Praetorian Guard. Had more time had been available, the Prefect of Rome Marius Maximus might have been able to muster troops to send as reinforcements to assist Macrinus. Despite their relative powerlessness, the Senate still declared war against the usurper and his family. Descriptions of the battle differ, and its location is debated. The decisive and perhaps sole engagement took place on 8 June 218; Dio places it at a defile outside of a village believed to be Immae, approximately twenty-four miles or so by road between Antioch and Beroea. Herodian challenges this assertion, suggesting that the battle took place closer to the borders of Syria Coele and Syria Phoenice, possibly near Emesa. Downey then suggests that two battles took place: an initial engagement matching the one described by Herodian, and a later battle near Antioch, which Downey agrees was the decisive point in the rebellion. Other historians either support Dio's suggested site near Antioch or make no claim with regards to the location of the engagement. Elagabalus' armies, commanded by the inexperienced but determined Gannys, engaged Macrinus' Praetorian Guard in a narrowly fought pitched battle. Gannys commanded at least two full legions and held numerical superiority over the fewer levies that Macrinus had been able to raise. Nonetheless, the engagement began in Macrinus' favour. According to Dio, Macrinus had ordered the Praetorian Guard to set aside their scaled armour breastplates and grooved shields in favour of lighter oval shields prior to the battle. This made them lighter and more manoeuvrable and negated any advantage light Parthian lancers (lanciarii) had. The Praetorian Guards broke through the lines of Gannys' force, which turned to flee. During the retreat, however, Julia Maesa and Soaemias Bassiana (Elagabalus' mother) joined the fray to rally the forces while Gannys charged on horseback headlong into the enemy. These actions effectively ended the retreat; the troops resumed the assault with renewed morale, turning the tide of battle. Fearing defeat, Macrinus fled back to the city of Antioch. Both Downey and Gibbon suggest that had Macrinus not fled, he might have eventually gained victory and secured his position as emperor. After his defeat, Macrinus sent his son Diadumenian to Artabanus V of Parthia, while he himself returned to Antioch, proclaiming himself victorious over Elagabalus in battle. News of Macrinus' defeat spread and many civilians who had supported him were slain in the city and on the roads. Macrinus shaved off his beard and hair to disguise himself as a member of the military police. Fleeing the city at night on horseback, he reached Cilicia with a few companions, masquerading as a military courier, and secured a carriage to drive to Eribolon, near Nicomedia. From there he set sail for Chalcedon. Macrinus travelled through Cappadocia, Galatia and Bithynia before arriving in Chalcedon. Here he was arrested, his guise revealed after he had sent requests for money. Men dispatched by Elagabalus apprehended Macrinus and brought him to Cappadocia. Diadumenian was captured elsewhere on his journey to Parthia, and killed by the centurion Cladius Pollio in Zeugma. French author Jean-Baptiste Crevier comments that Macrinus threw himself out of the carriage at Cappadocia after receiving the news of the death of his son, breaking his shoulder in the act. Macrinus was executed in Archemais in Cappadocia after attempting to escape; Dio mentions that the centurion Marcianus Taurus was responsible for his execution. Thus, the reign of Macrinus as emperor of Rome ended after nearly fourteen months. In the meantime, Elagabalus had entered Antioch and declared himself the new ruler of Rome in a message to the Roman Senate and people. Once again, as they had done with Macrinus, the Senate were forced to recognize Elagabalus as the new emperor. Elagabalus' claim was not uncontested, as several others made their own bids for "the purple". These included Verus the commander of Legio III Gallica and Gellius Maximus the commander of Legio IV Scythica. History professor and author Martijn Icks notes the irony of Verus' claim as his legion had been the first to proclaim Elagabalus as the rightful emperor of Rome. These rebellions were quashed and their instigators executed. By March 222 A.D., Elagabalus was himself murdered by the Praetorian Guard, his body dumped in the river Tiber and his memory condemned by damnatio memoriae ordered by the senate. ^ Dando-Collins 2012, p. LXI. ^ Vagi 2000, p. 281. ^ a b c Potter 2004, p. 146. ^ a b Gibbon 1906, pp. 176–177. ^ Mennen 2011, p. 162. ^ Goldsworthy 2009, p. 74. ^ a b Goldsworthy 2009, p. 75. ^ Potter 2004, pp. 146–147. ^ Gibbon 1906, p. 178. ^ Dunstan 2010, p. 406. ^ Ando 2012, p. 63. ^ Gibbon 1906, pp. 179–180. ^ a b c Bunson 2014, p. 338. ^ Scott 2008, p. 76. ^ Scott 2008, p. 108. ^ Scott 2008, p. 109. ^ Scott 2008, p. 110. ^ Scott 2008, p. 104. ^ Gibbon 1906, p. 181. ^ Scott 2008, pp. 108, 124–128. ^ Goldsworthy 2009, p. 76. ^ a b c Gibbon 1906, p. 182. ^ Goldsworthy 2009, pp. 76–77. ^ Scott 2008, p. 151. ^ Scott 2008, pp. 144–146,151. ^ a b c d e f g h i Downey 1961, pp. 249–250. ^ a b Gibbon 1906, p. 183. ^ Cassius Dio 1927, p. 417, 79.34.3. ^ Cassius Dio 1927, p. 417, 79.34.4. ^ Scott 2008, p. 45. ^ Scott 2008, pp. 154–155. ^ a b c d Gibbon 1906, p. 184. ^ Scott 2008, p. 68. ^ Goldsworthy 2009, p. 78. ^ Grant 1996, p. 24. ^ Dunstan 2010, p. 407. ^ Cassius Dio 1927, p. 425, 79.37.4. ^ Scott 2008, pp. 155–156. ^ a b c d e Crevier 1814, p. 237. ^ a b c d Bell 1834, p. 229. ^ Cassius Dio 1927, p. 431, 79.40.5. ^ Crevier 1814, pp. 236–237. ^ Cassius Dio 1927, p. 431, 79.39.6, 79.40.1 and 79.40.2. ^ Icks 2011, pp. 1–2. Bunson, Matthew (2014). Encyclopaedia of the Roman Empire. Infobase Publishing. ISBN 1-4381-1027-8. Cassius Dio (1927) [c. 230]. Roman History. Harvard University Press. ISBN 0-674-99196-6. Dando-Collins, Stephen (2012). Legions of Rome: The definitive history of every Roman legion. Hachette UK. ISBN 1-84916-791-5. Downey, Glanville (1961). History of Antioch in Syria: From Seleucus to the Arab Conquest. Literary Licensing LLC. Dunstan, William (2010). Ancient Rome. Rowman and Littlefield Publishers. ISBN 0-7425-6834-2. Gibbon, Edward (1906) . The History of the Decline and Fall of the Roman Empire, Volume 1. Fred de Fau & Company. OCLC 187300332. Goldsworthy, Adrian (2009). How Rome Fell. Yale University Press. ISBN 0-300-15560-3. Grant, Michael (1996). The Severans: the Changed Roman Empire. Psychology Press. ISBN 0-415-12772-6. Icks, Martijn (2011). The Crimes of Elagabalus: The Life and Legacy of Rome's Decadent Boy Emperor. I. B. Tauris. ISBN 0-85773-026-6. Mennen, Inge (2011). Impact of Empire, Volume 12: Power and Status in the Roman Empire, AD 193–284. Brill Academic Publishers. ISBN 90-04-20359-1. Potter, David (2004). 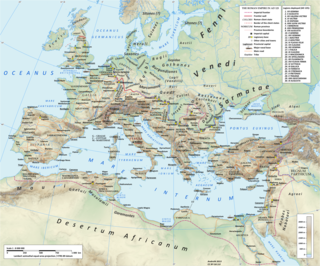 The Roman Empire at Bay, AD 180–395. Psychology Press. ISBN 0-415-10058-5. Macrinus was Roman Emperor from April 217 to 8 June 218. He reigned jointly with his young son Diadumenianus. Macrinus was by origin a Berber from Mauretania Caesariensis. A member of the equestrian class, he became the first emperor who did not hail from the senatorial class and was the first emperor from Mauretania. Before becoming emperor, Macrinus served under Emperor Caracalla as a praetorian prefect and dealt with Rome's civil affairs. He later conspired against Caracalla and had him murdered in a bid to protect his own life, succeeding him as emperor. The Parthian war of Caracalla was an unsuccessful campaign by the Roman Empire under Caracalla against the Parthian Empire in 216–17 AD. It was the climax of a four-year period, starting in 213, when Caracalla pursued a lengthy campaign in central and eastern Europe and the Near East. After intervening to overthrow rulers in client kingdoms adjoining Parthia, he invaded in 216 using an abortive wedding proposal to the Parthian king's daughter as a casus belli. His forces carried out a campaign of massacres in the northern regions of the Parthian Empire before withdrawing to Asia Minor, where he was assassinated in April 217. The war was ended the following year with the Romans paying a huge sum of war reparations to the Parthians.